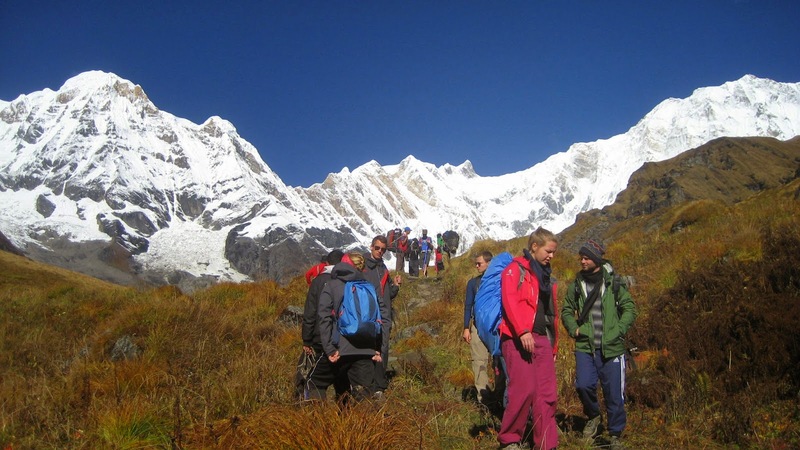 Annapurna Base Camp Trek | Adam Tours & Travel Pvt. Ltd.
Annapurna Base Camp Trek is one of the most popular moderate treks on earth , the trail passes through cascading waterfalls, beautiful villages, terraced farmlands, lush rhododendron forests, and amazing mountain vistas before reaching the base of the mighty Annapurna. This offers enough time to witness the staggeringly beautiful peaks of all the Annapurna giants that encircle the basin Mountains in Annapurna region form the central core but it is not the tallest, because they rise in the heart of Himalayas. Annapurna I, Hiunchuli, Annapurna II, Gangapurna, Annapurna III, Machhapuchhre, Annapurna IV etc are some of the mountains in Annapurna region. The Annapurna base camp trek also guarantees you fun, pleasure and a magnificent insight about the natural and cultural heritages of the tiny Himalayan country, Nepal. It is one of the most beautiful treks passing through the diverse ethnic group’s culture and verity vegetation forest and wildlife. To reach Annapurna region, we need to follow the trial of terraced lands, dense beautiful forest of rhododendron, Gurung community traditional and cultural villages. The trek start from Nayapul about 1 hour 30 minutes drives from Pokhara. Pokhara recognized as the beautiful city of whole Nepal is the Gateway of Annapurna base camp trekking, you feel saturated by the nature and unidentifiable calm in the heart and soul. The main part of Ghandruk valley is on the top of the ridge, more than 500m above. Mostly our path will be the high lands of Annapurna region, we may have problem, so our body temperature should be accumulated according to the altitude. So that the problem neither may nor arise during trek. Firstly we will reach to Nayapul. Then Tikhedhunga, Ghorepani, Tadapani, Chhomrung, Deurali and lastly to Annapurna base camp. We will be in many view points. Among them poonhill will be the most beautiful view point from where we can see the combination of more than 10 mountains serially. Since our trial goes clock wise we will not return back same way. To end our trek from Annapurna base camp, our returning way will be Bamboo. The trail finally stumbles across moraines and reaches the world of ice and snow Annapurna Sanctuary from where you will see incredible 360 degree views of the Annapurna ranges and above the massive Annapurna glacier. Collecting lifetime experience, we retrace from Annapurna Base camp to Chomrong and then to the Jhinu Danda where is the natural hot spring and you can enjoy in the small bath pools, from here The trail leads to a rhododendron forest and passes through charming villages of Nepal’s ethnic communities of the Gurung,& Magar. Generally Annapurna Base camp trekking is considered at moderate trekking because our trek will be at high altitude but not in the difficult path. Month of September, October, November, December, March, April, May and February will be the most favorable time to do trek in this region. Nepal Base Camp Treks is always on your front foot to help by making you to trek in Annapurna base camp throughout the year. We will make your trekking schedule according to your holiday with provision of best trekking guide for you. This amazing trek finishes at Phedi from where we take a short drive to Pokhara. Day 15: Pokhara to Kathmandu, take a 25 minutes flight or 6-7 hour drive. After breakfast next morning, the trail descends where you find beautiful waterfalls. Beyond this town, the trail ascends gently crossing numerous streams and terraces continuing on to Landruk, a beautiful Gurung village which provides an excellent view of the surrounding mountain ranges. The trail emerges in the main Modi Khola valley and reaches Tolkha (1850m) and continues towards Pothana. The view of Machhapuchhare (6997m) is excellent from here, except that from this angle it looks more like Matterhorn than a fish tail. Today we will walk along a paved stone trail through Rhododendron forests arriving at Dhampus (1750m). The village is inhabitant of Brahmans, Chhetris and a few Gurungs. Now you trek through flat land for some distance and steeply descend to Dhampus Phedi. After a rest here we will walk mostly downhill through fields to the forest and on to the Phedi. A 30 min drive from Phedi brings you to Pokhara. We spend a beautiful night in beautiful Pokhara city. Day 15:Pokhara to Kathmandu, Take a 25 minutes flight or 6/7 hour Drive. Adam Travel have made every effort to keep our price as competitive as possible, by still providing an excelling service to our customer. We pay our porters and guide the legal wages agreed with the porters union, our trekking staffs are some of the best paid in Nepal which allow us to attract only the best guides and porters and we have same amount of Insurance for guide and porter which is more than Government fixed amount. All our price are net and there are no hidden cost everything is clear on cost includes and excludes this is the main reason all our customer are happy from our service. For up to date cost for the trip please contact us. Alcoholic, hot and cold drinks,hot shower, Mineral/hot water, desserts.